If you’re in NYC at the end of September, drop into ICP for a lot of Japanese photobooks, and three impeccably trendy Japanese photo magazines. It’s billed as 10X10 Japanese Photobooks, and Phot(o)lia explains. Simply: 10 specialists select 10 books each for a pop-up reading room of 100 Japanese photobooks that coincides with the New York Art Book Fair. By my count, twelve specialists, so duodecimal notation. And then: 10 online Japanese photobook specialists and bloggers recommend 10 books each for an additional 100 books of interest. I count thirteen specialists and bloggers. Yow, tridecimal notation! If the person in charge would kindly inform Microcord, Inc of who my fellow C [base-13] specialists and bloggers would be, and details of a tie-in with a suitably prestigious event in one or more of Paris, Milan, London and New York, I’ll have my staff let you know my decision. Were I in London I’d head to the Photographers’ Gallery, for the show Contemporary Japanese Photobooks, advertised as presenting over 200 rare Japanese photobooks. 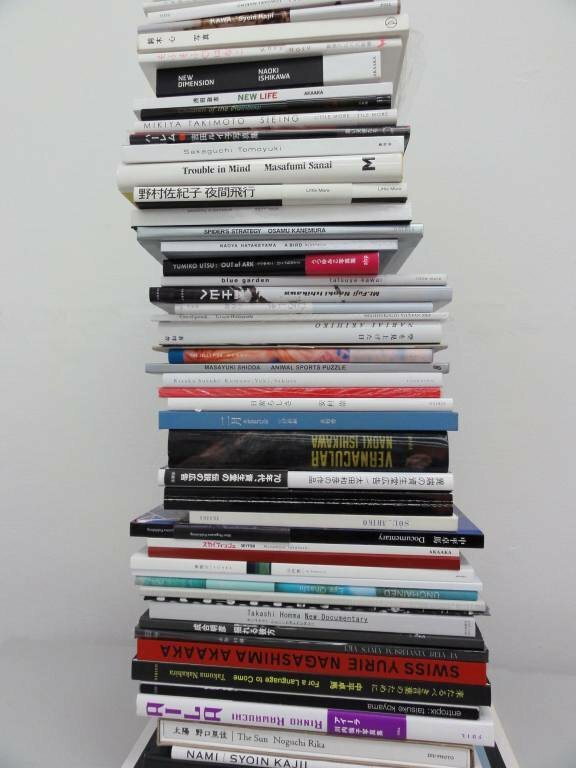 A slightly more informative page of the Photographers’ Gallery says that these are over 200 Japanese photobooks that are virtually impossible to find in the West, all produced within the last ten years. It’s not surprising that Japanese photobooks are virtually impossible to find in Britain. French, German, Italian, Swiss, and perhaps even Spanish and Czech books circulate in western Europe; but Lithuanian, Taiwanese, Greek and Japanese ones tend not to. So the books will be rare in Britain. Undoubtedly this event gives Londoners and visitors a chance to see photobooks that they’d otherwise have trouble seeing, unless they were in Japan (now with added caesium). Still, it was imaginable that there would be some genuinely (even in Japan) rare Japanese photobooks from the last decade; I wondered just what Jason Evans and Ivan Vartanian had amassed. They don’t say. But they do show a weighty pile in a single photograph. Some of the spines are easy to read, some a little harder . . . once I’d started the job of squinting for characters and clues, I found myself hooked. Below is my attempt to list what’s in the pile. For each, the order is (i) author (roman and Japanese), (ii) title (roman, if available, and Japanese, if available), (iii) ISBN, (iv) price new. “O/P” means out of print. The underlined name is the surname. When the roman-letter name of the photographer is significantly different from the expected romanization, I add the latter in parentheses. If I don’t see a roman-letter title, I provide one in parentheses. If I don’t know the ISBN, I give the CiNii entry (if I find one). With trivial exceptions, new book prices in Japan are fixed. But of course used copies can be cheaper. And they often are cheaper, though I don’t bother to point this out below. Ishikawa Naoki 石川直樹, New Dimension, ISBN 4903545180, O/P. Original price ¥5250; Amazon.co.jp has used copies from ¥6740. Book Off doesn’t have a copy right now, but when it does the starting price is ¥3400 (from where it may sink). Sakaguchi Tomoyuki 坂口トモユキ, Home, ISBN 4-94120-00-0, ¥3990. Here in CiNii. Sanai Masafumi 佐内正史, Trouble in Mind, ISBN (if any) unknown, ¥4725. Signed copies available from the publisher (here) for the same price. Here in CiNii. Kanemura Osamu 金村修, Spider’s Strategy, ISBN 4309904408, O/P. Original price ¥3780; Amazon.co.jp has used copies from ¥17,900. (And Kosho.or.jp is a bit more expensive.) Yes, this book does cost a lot (see below). Hatakeyama Naoya 畠山直哉, A Bird: Blast #130, ISBN (if any) unknown, O/P. Here at CiNii. This further installment of stuff being blown up is elusive, but before you pay a lot for a copy NB it runs to just 35 pages (says Google). Takashi Homma ホンマタカシ (Honma Takashi), New Documentary ニュー・ドキュメンタリー, ISBN 4900050563, O/P (I think). Original price ¥2500; Amazon.co.jp has new copies from ¥2500. Nariai Akihiko 成合明彦, 揺れる彼方 (Yureru kanata), ISBN (if any) unknown, O/P. Kosho.or.jp shows used copies from ¥1575. If you’re unfamiliar with yen, convert the yen prices via for example xe.com. Of the 31 books I’ve identified, new copies of all but six are straightforwardly available from any Japanese book retailer. Most of the remaining six are also easy to find at a sensible price. One is easy to find at a silly price; perhaps less because it’s rare (it isn’t) or particularly interesting than because it’s been Badgered: Yes, Spider’s Strategy is on p.318 of The Photobook: A History, vol. 2. (Oddly, Carl De Keyzer’s excellent Zona, on the facing page, is 11 years old but was still available at the RRP the last time I looked.) Spider’s Strategy presents utility poles and suchlike street clutter (there’s a good sample in Street Photography Now): you get the same kind of thing in Kanemura’s more cheaply buyable Happiness is a Red Before Exploding (a respectable second place in the Photobook Title Grand Prix behind The Palace Explodes the Shrimp Bail, When the Flower Want to Oxygen and Nutrition, I Will Help Too Much). Which of the books are rare (in Japan)? Depends what “rare” means, but it can easily cover Nariai’s Yureru kanata (which like Spider’s Strategy is over ten years old) and Hatakeyama’s booklet . . . although not much else. And my recommendations? Certainly some of the books are mildly interesting but I can’t strongly recommend any. (I possess two, but might well sell off both.) I don’t think I’ve ever seen a dozen among them; all twelve might be excellent, and of course it’s possible that I got the wrong impression when I flicked through the other twenty or so in this or that bookshop. If I were at the Photographers’ Gallery show, I’d certainly want to look at several (let alone at those that aren’t in the photographed pile). If you see something in the show that’s good, and want to see the same book later (or even buy it), where should you start? ISBNs are more useful than roman-letter data (unless roman lettering is all there is). Wikipedia has an ISBN-driven book search tool. (If you need to convert from 13- to 10-digit ISBN or vice versa, use isbn.org’s ISBN converter.) Books published by Sokyusha, Rat Hole, Hysteric, and tiny publishers tend not to have ISBNs, and exhibition catalogues also tend not to. Most Japanese libraries ignore WorldCat and instead use CiNii. Junkudo–Maruzen is a large book chain that lets people order books for delivery by mail. In Junkudo search page, 書名 means title, 著者名 means author (including photographer), 10- or 13-character ISBNs should be entered after stripping hyphens or similar). Kinokuniya is similar. Its website does have pages in English but they don’t actually present anything of use. Here’s the search form (ISBNs may have hyphens but needn’t; 書名 means title; 著者名（漢字）means author). Book Off is a chain of inimitable used bookshops. (These are excellent sources for books by Habu, Miyoshi, and Shinoyama. Uhhh. Still, I’ve found Tony Ray-Jones’ A Day Off there for a thousand yen or so, and just last week I got Hashiguchi’s Zoo for ¥105.) At the top of the main page of its website, for 商品検索 select 本・書籍; add the author or title in the longer field, and hit the yellow button next to it if you’re interested in anything, the blue one for only used examples. JADOB’s kosho.or.jp is a book search website. On its search page, type the title after 書 名 and/or the author after 著者名; when you’re ready, hit the button below marked 検索開始. Sūpā Genji is another book search website. On its search page, 書籍名 means title and 著者名 means author; hit the brown 検索 button below to start searching. NADiff has a branch in the Tokyo photo museum (Ebisu) and thus should be fairly cosmopolitan. Although the recent history of the book biz in Japan is mostly a gloomy one of bankruptcy and collapse, a bright spot is Tsutaya in Daikan’yama. And yes, it sells over the web. Here’s the place. Its rather primitive search facility doesn’t seem to understand ISBNs, but if you type a title or photographer’s name in the little white box at the top of the page (the one with a stylized magnifying glass) and hit the dark grey button to its right marked 検索, you may get a result. When you search within any of the above, don’t use the roman-letter form of the photographer’s name, and (unless there is no conventional Japanese title) don’t use the roman-letter title either. Roman-letter alternatives tend to be supplied for export and decoration only. It’s not obvious that any of the enterprises above realizes that people who don’t happen to have Japanese addresses or to be fluent in Japan may nevertheless want to exchange their cash for Japanese books. But with all the talk in Japan of internationalization, nay, globalization, my impression must surely be wrong. You, dear reader, may wish to check with the particular company. (Please be polite!) Here’s how. For Junkudo–Maruzen, info at junkudo.co.jp (from this page) . For Kinokuniya, go to this page, hit the orange button under the box full of legalistic mumbo-jumbo, and on the next page give your mail address for メールアドレス, your name for お名前, the lowest option for 件名, and write your question at お問い合わせ内容, and when you’ve finished hit the button below this. For Book Off, go here; choose the lowest option for お問合せの種類, give your email address for 返信用メールアドレス and your name for お名前, write your question in 内容, and when you’re ready hit the yellow button at the bottom. For kosho.or,jp, the address for questions (from the foot of the page) is info at kosho.or.jp. For Sūpā Genji, info at murasakishikibu.co.jp (from this page). NADiff’s address (from the foot of its pages) is artshop at nadiff.com. Tsutaya Daikan’yama’s contact form is here: for お問い合わせ内容の種類, choose the lowest option; for お名前, give your name; for メールアドレス, give your mail address; in お問い合わせ内容, write your message; check the box at the bottom left (allowing the recipient to use your personal info for this or that); and click the red button at the bottom. But there are anglophone-user-friendlier options. A branch of Mandarake まんだらけ manages both to be one of the most depressing places in Japan and also one of my favourite bookshops. Depressing, because of all the manga, anime and other kiddie stuff that’s avidly consumed by adults. (I say this despite enjoying some comic books myself.) Favourite, because once I get to the photobook section it has good stuff, reasonably priced. (Often, as-new copies of new books, reduced.) Yes, I’ve just discovered that Mandarake lists its photobooks (or some of them), explains itself in English, ships abroad, and takes PayChum. The site has a search engine that I can’t get to work (e.g. although it obviously has books by 荒木 [i.e. Araki], searching for 荒木 brings no hits). But a bit of ingenuity can surmount this. (For example, save each 100 hits to a text file, concatenate these into one giant text file, and search within this.) I notice used copies of a few of the books in the pile above, at well below the list price — and if you must acquire something famous and expensive (say, Fukase’s Karasu, 1st ed), you’re unlikely to find better value anywhere else. There’s also the Japanese branch of a certain US book monopolist and purveyor of small tablets and other sundries for modern life, a company that surely needs no additional advertising from me. The occasional publisher will sell direct. Here for example is Akaaka — in English, talking about sending abroad, and accepting PayPal. Publishers that don’t seem to offer this may have email addresses you can try. And there’s Japan Exposures (and particularly this). There’s PH, too. You’ll probably find each a lot easier to use than most of the options above. NB for most of its titles, Japan Exposures must itself buy from a retailer, not a wholesaler, and therefore it must charge more. PS See Fred Butler’s description of the show, complete with one photo showing a lot more spines.